There is nothing more enjoyable than unplugging form the digital world, saddling up on horseback, and heading out into the countryside. In Blue Ridge, forty percent of the county’s land is located within the Chattahoochee National Forest and has countless miles of trails to explore and enjoy. Fresh mountain air, beautiful scenery, abundant wildlife, and getting in touch with nature is what it’s all about. 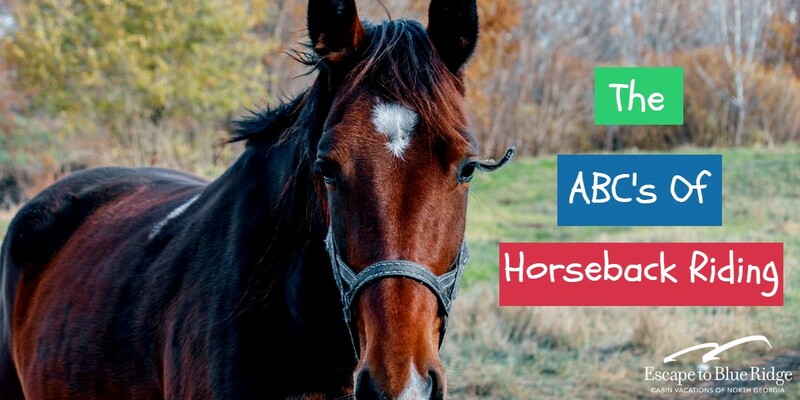 Whether you are a beginner or an experienced equestrian, one of the area’s local outfitters would love to show you our country side and provide you with a rewarding, memorable, and exhilarating trip. A love of family and horses led to the creation of S&T Stables and then in 2017 they designed and created Appalachian Trail Rides at S&T Stables. Proudly providing trail rides on 250 acres of privately-owned mountainous farm land, visitors can ride through pastures on scenic trails and gallop around private lakes and cross creeks while seeing wildlife frolic in their natural habitat. The youngest family members can enjoy pony rides and anyone 6 years and older can enjoy trail rides. Luke and Blair of Appalachian Trail rides have created a Proposal Ride for blossoming love or Dinner Rides complete with a delicious meal and songs around the campfire! Almost Heaven is a spectacular cabin set high up on a mountain crest. This three-bedroom three bath cabin is snug in the treetops of an enchanting forest that makes for natural framework around layered panoramic mountain views. 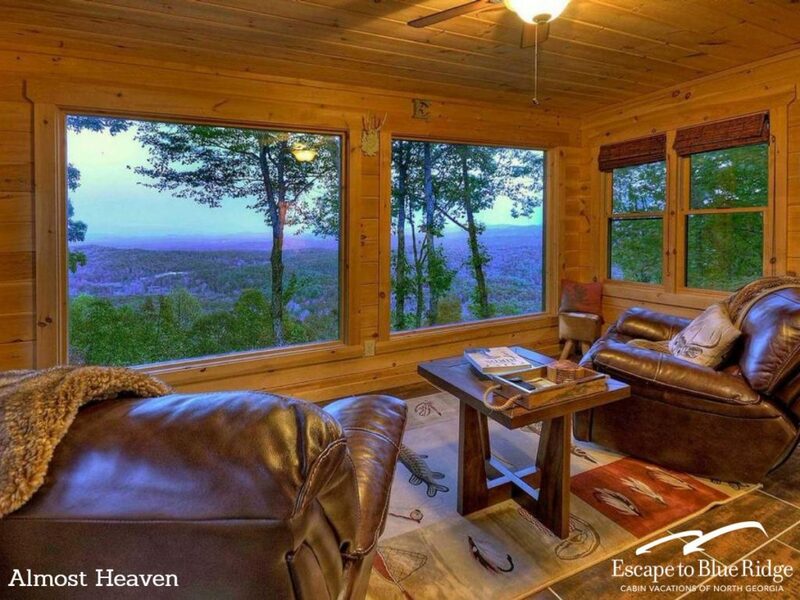 Whether you wish to lock yourself away for a romantic or sentimental gathering or create a wonderful family vacation filled with adventure — Almost Heaven will have you on Cloud Nine. Year-round horseback riding adventures are available at Blanche Manor in Blue Ridge for all age levels and skill levels. Trail rides will take you through unspoiled scenery and take in views from three states – Georgia, North Carolina, and Tennessee. You can choose from a leisurely stroll through wooded trails or sign up for the City Slicker Special where you can learn how to barrel race or do an obstacle course on horseback! Complete with Sunset rides, pony rides, and full day experiences you will enjoy every minute of your time with Kimberly and her team of experienced guides. Taking its name from the hundreds of acres of picturesque horse farms in the surrounding area, Bucking Horse is a distinctive Georgia Mountain cabin rental that offers the peaceful getaway from your everyday life that you are craving. Perfectly situated in the Cashes Valley Area, this four-bedroom, 4-bath cabin invites you to enjoy the sounds and sights of nature from the spacious, multi-level decks and balconies. Take in the majestic mountain views as you rock your cares away on the back deck or sink into the steamy and rejuvenating waters of the hot tub. Let the scenic woods and calming mountain views from Bucking Horse envelop you as you create a truly memorable mountain experience that will last a lifetime- and having you longing to return! Spend a half day or a full day riding trails through the Cohutta Wildlife Management area. This family owned and operated horse farm is widely known for training, boarding, sales, riding lessons, and outfitted trail riding in the Chattahoochee National Forest. They believe in the importance of finding a horse to suit your needs and skill level. Heather and her team will take guests on a thirteen-mile trip through stunning landscape. The ride takes a break at Jacks River Fields, a primitive campground, for a picnic lunch and a leg stretch, before picking up the trail and returning back to the stables.